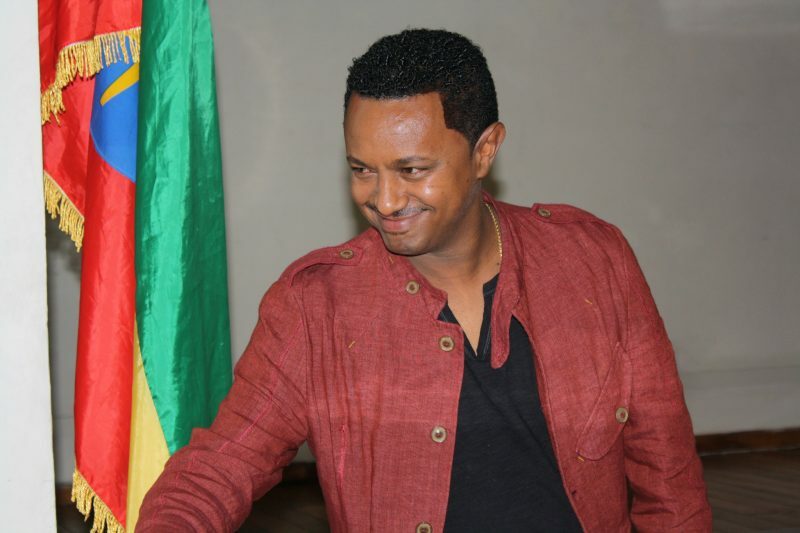 Ethiopian singer Tewodros Kassahun’s most anticipated and highly promoted studio album was released to great fanfare at the beginning of May 2017. Ethiopian singer Teddy Afro, who delivered opening remarks at a U.S. Embassy-sponsored workshop for students on the occasion of World Environment Day 2015. Photo by U.S. Embassy Addis Ababa; CC BY-ND 2.0. More popularly known as Teddy Afro, his latest album — his fifth — comprises 15 songs of tribute and love that touch on issues of solidarity, reconciliation and the hope of living collectively in a diverse country. The album also includes a song with lyrics in a coded language, which is being interpreted by some as a rebuke to his detractors. Ever since he caught the public’s attention with his debut album in early 2001, Teddy Afro has been a household name in Ethiopia. He is a melodic singer and prolific songwriter. “Ethiopia”, a single that appeared on his new album, racked up millions of views on YouTube as soon as it was released. His album attracted sales of up to 6 million Ethiopian Birr — a feat that no other Ethiopian singer has ever managed to accomplish — which is telling commentary on his popularity. The recurring theme in Afro’s albums, is the need to nurture countrywide harmony, unity, and love which transcend ethnic and religious boundaries in his beloved Ethiopia. Expanding upon this foundation, this latest album solidifies this message, both in thematic content and lyrics. While the album is mainly an Amharic language pop music offering, some segments of lyrics are inserted into his Amharic songs from other Ethiopian languages, such as Afan Oromo, Tigeregna, and Sidama, which all reflect the singer’s philosophy and interests. He blends his version of reggae with Ethiopian beats, styles, and instruments. His deployment of the sound of mesenqo, a single-stringed Ethiopian bowed lute, which he mixes delicately with acoustic guitar, bass guitar and drums — while he sings in Amharic and Afan Oromo on one of the tracks — is a great example. The response to Afro’s album has been mixed. Teddy’s fans and detractors either apotheosize or admonish him based on his fame, his lyrical perspective — even his album’s cover art. His enthusiasts adore him for his genius, while his detractors accuse him of simplifying the complex history of Ethiopia. The near-fanatical appreciation for — and opposition to — Afro’s latest album is an indication that, in Ethiopia, music criticism usually melds together with political ideology. 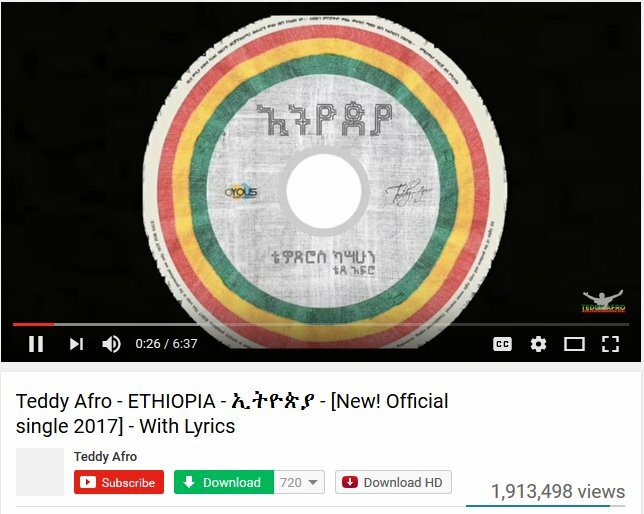 Since the release of the album’s single, “Ethiopia”, three weeks ago, much of the debate on social media has been about the politics of Afro’s songs. He received an unprecedented amount of criticism for being simplistic — penning lyrics that misrepresent the history of Ethiopia, the poetic quality of which, some believe, mixes cliché and nonsense. As political concerns take priority over the quality of the music, the artistic aspects of Afro’s work are receiving less attention. However, there are some critics who falsely accuse him of recycling melody lines from his earlier albums, or even plagiarizing other people’s songs. As much as Afro is a prominent and influential artist, he is also a vulnerable one — producing socio-politically conscious songs while operating in a politically hostile environment. Ethiopian authorities have been known to censor political expressions, whether journalistic or cultural. Afro was once denied playing a gig in the country’s capital, after authorities refused to issue a permit for the concert. He was also prevented from leaving the country for a concert abroad. In 2014, some individuals campaigned against him to strong-arm a beer company to cancel its sponsorship of Teddy’s national music tour over an alleged “politically insensitive” comment in an unpublished weekly magazine. In 2005, when he released his second album, Afro was aligned with opposition politics because five of his songs were overtly political. One signature song in particular, “Jah Yastserial” can be read as a call for reconciliation among Ethiopian political opponents, a praise for Emperor Haile Selassie or, most plausibly, a critique of the Ethiopian government for failing to live up to its promise. Many consider this song as a popular anthem of anti-government protesters, as it resonates well with the mood of the post-election political turmoil of the 2005 parliamentary elections. In 2008, Afro was arrested, charged with a hit and run, taken to jail and held there for almost two years. He denied he committed the alleged crime, and most of his fans claim the allegations are false and politically motivated. While Afro does not fit the rebellious image of an overtly political singer, he forcefully asserts a collective version of Ethiopian history, culture, and identity, without bowing to pressure to adopt a political posture. In Ethiopian history, the dominant ideology was a national identity based on a shared, yet hybrid cultural and ethnic solidarity, with a modernizing project based on claims of Ethiopia’s 3000 years of “collective memory”. However, this project came to an abrupt stop in 1991, when two decades of civil war ended. The current regime defined “communities” based on their ethnic identity, and reorganized the Ethiopian state structure exclusively based on this — a deliberately administered, radical break with Ethiopia’s past. Many blame the current regime for the gradual erosion of the shared Ethiopian identity. In what appears to be a response to the government’s over-emphasis on ethnic identity, Afro’s songs pay tribute to early Ethiopian civilization, history, and culture. He praises national figures of the past and considers them as enlighteners. In his latest album, he honored Tewodros II, a 19th century Ethiopian emperor who fought the British. In his fourth album, he did the same for Emperor Menelik II, who defeated the Italians in 1896 at the Battle of Adwa. His assertion of a shared Ethiopian identity and national pride in an era of ethnic federalism, in which the regime has denied the existence of collective Ethiopian identity, is a potential threat. For government supporters and ethnonationalists alike, Afro is a familiar villain. His tributes to past Ethiopian leaders and his devotion to “love and unity” represent an old Ethiopia, a defeated ideology. Nevertheless, he continues to be a magnetic figure for younger generations and exerts a vast influence among his compatriots. Despite claims that Afro’s songs represent a defeated ideology, his albums generate sales on a record scale — and his fan base is passionate enough to overwhelm the Ethiopian internet and send the message that they are taking a relaxing break from repression. « UN Security Council may deliberate on HR issues in peace & security issues, TPLF wallows in self-serving opposition!